The major new six-part drama series, produced by Rainmark Films, sees Sean Bean return as John Marlott - no longer a mere mortal, Marlott’s purpose is to seek revenge on Lord Daniel Hervey for taking his life, and to redeem his soul after being wrongly convicted and hanged for murder. EL HIPNOTIZADOR is an original HBO Latin America miniseries. 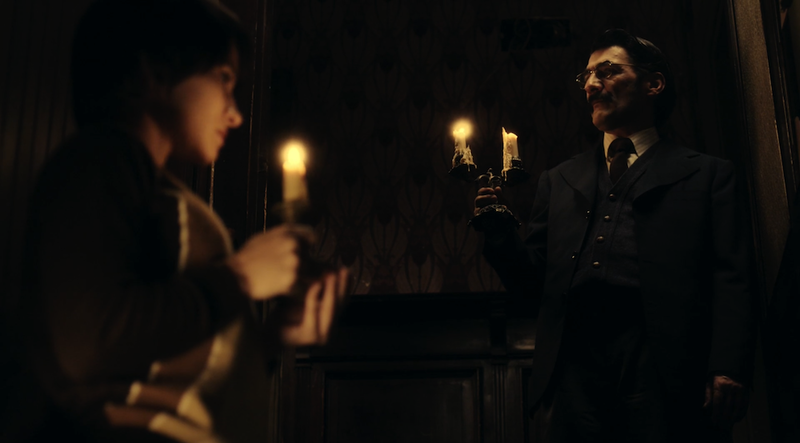 In episode 5, Domingas asks Arenas for help to reveal the reason behind her ghost’s apparition. He hypnotises her on stage and apparently the mystery is solved. Darek goes to the clock shop and Castor shows him the “mirror” that will lead Arenas to his downfall. Hypnotised, Gregorio attempts to commit a murder. Back at the hotel, Arenas receives terrible news. EL HIPNOTIZADOR is an original HBO Latin America miniseries. In episode 6, Arenas is arrested on suspicion of murder but Commissioner Renzo is ready to make a proposal. Arenas will have to hypnotize Lerma, the only remaining member of a gang who stole money from a heist in the central bank, and now lives in an insane asylum. Lerma thinks he is the king of Strombolia. Behind his insanity lies hidden the clues for the stolen money and to Arenas freedom. A film made for HBO Latin America. Fiction. Nine-year-old Checho, is bullied at school for being Bolivian. At home, the reality of his mother is no different. When their situation reaches the limit, they unite to fight for freedom. Scripted, played by non-actors, real immigrants who live in São Paulo, Brazil. HBO Latin America original series. In ep. 9 "The Adversary", Carlo and Miguel, a Dominican priest, seek to understand the phenomenon of a 14-year-old girl who is "embodied" by the devil. From the age of 6, Deia mimicked demonic possessions that she saw in horror films. Desperate for money, her parents decide to put a little act whereby their daughter would perform a devil’s possessed girl in front of an audience eager to hear the juicy truths that she had to say about their neighbours. Deia would come out of those nights unharmed and live like a normal girl. But, now at 14, the devil came back and the possessions don’t seem to be impersonations anymore. Psychoanalysis meets the old Rituale Romanun of Exorcism. EL HIPNOTIZADOR is an original HBO Latin America miniseries based on an Argentinian graphic novel written by Pablo de Santis and illustrated by Juan Sáenz Valiente. The story of Arenas, a hypnotist who can put people into a trance and make them reveal their innermost secrets. He is a man of mystery, lonely and isolated, who suffers from perpetual insomnia, behind which lies a terrible secret. During the course of the series Arenas will break into people’s traumas only to find clues for his own secret past. Ultimately he will have to confront Darek, another hypnotist who may be behind our hero's ordeal. An AXE (LYNX) sponsored short sci-fi film that explores the perils of contemporary relationships. A film made for HBO Latin America. Fiction. SERENO is a drug-trafficking, crime drama shot in São Paulo's African underworld. Played by non-actors, real immigrants who live in SP, Brazil. EL HIPNOTIZADOR is an original HBO Latin America miniseries. In episode 2, Arenas attempts to help Antunes Calambó, a fellow guest of the hotel who lost a day and may have killed someone. The hypnotist goes to the Wonderland Fair and meets Celso, a man who buys and sells days, and who seems to know about Arenas’ past. Meanwhile Castor recruits Gregorio to watch the hypnotist. EL HIPNOTIZADOR is an original HBO Latin America miniseries. In this clip, Arenas, tortured by Renzo, accesses his long lost memory of Lívia and the events that led to her death.